Automatically dispatch tickets based on the configurable OQL rules. Automatically dispatch tickets to teams when entering a state. Allow to dispatch automatically Ticket based on predefined Dispatch rules, to a team and trigger a transition. Each time a Ticket enter a state, iTop searched for Dispatch rules which apply to this class and state. If it finds one, then it uses each Team rules in order to retrieve a team. The Ticket is assigned to the first team found and Ticket is moved to a different state. If no team is found, the Ticket is left unchanged. Example: when a Ticket is created, it is automatically dispatched to the team with role 'Support level1' defined on the customer Delivery Model, and moved to status 'Dispatch'. And any combination of those. If more than one team is returned, first will be used without guarantee that it will always be the same one. 2017-09-26 1.0.0 First official version. This extension is executed after combodo-approval-light or combodo-approval-extended, therefore if an Approval rule changes the object's state, Dispatch rules that should have been applied on the previous state will not be computed. Dispatch rules must be defined on each final class, not on abstract class. This extension is not designed to set a team without changing the state. Copy extension in iTop /extensions folder and run the setup. There is no parameter defined in the iTop configuration file. A dispatch rule is defined for one Class of Ticket. It must contain at least one Team rule and one State rule. First create a new Dispatch rule by opening the corresponding menu under Service Management. A State rule defines the state in which you want to auto-assign a team, and which transition must be applied if a team was found. Create at least one State rule in the States tab. A Team rule defines how to retrieve the team to assign. Create at least one Team rule in the corresponding tab. Mandatory Free name of the rule, for humans. Mandatory Order for using the Team rules, lowest number first. Mandatory Allow to prepare Team rules, without activating them. Rules with 'No' will not be used. You may want to define a support team per Service, in which case, the best is to add a new attribute support_team_id on Service, as an ExternalKey to a Team. But you may also keep the default datamodel and ensure that only one single team is linked to each service. You may want to use the team defined on the Service when there is one, otherwise use the default team defined on the delivery model of the customer. 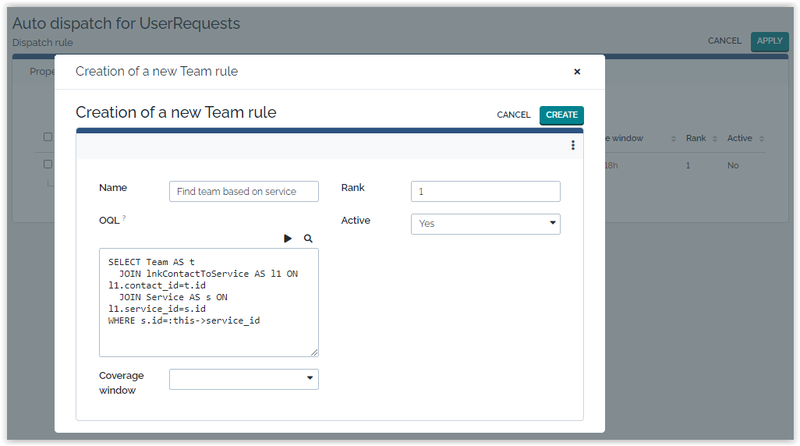 In which case you will create 2 Team rules, one based on Service with the lowest rank and the other using the OQL above. It is quite common that you want to Auto-Dispatch tickets created by users through the Portal, Ticket creation from Email, but do not want to do it, when the ticket is created by a synchro, a script or maybe an agent in the console. That's the purpose of the Disabled contexts field. Examples: Let's say you have created a special portal for your agents and you want Tickets created through that portal not to be auto-dispatched. Then to disable the Dispatch rule, set Disabled contexts = Portal:agent-portal.